Human-elephant conflict has escalated in Nkala Game Management Area in recent years despite deterrent measures introduced by Zambia Wildlife Authority (ZAWA) such as chili dung blocks, chili grease fences and fireworks. ZAWA no longer has the resources to carry out elephant deterrent measures and farmers have become resistant to continuing this effort and skeptical about its effectiveness which may be directly related to the poaching of elephants in Kafue National Park and community members choosing not to reveal information about poaching events to government authorities. Therefore new, cost-effective methods to alleviate human-elephant conflict are needed to build relationships between wildlife authorities and community members and to help farmers and elephants co-exist. Game Rangers International’s (GRI) Kafue Research Project (KRP) will trial new, innovative solutions for human-elephant conflict including enhancements to the 2014 IEF-funded experimental trials of Flashing Light fencing systems that deter elephants from maize crops, and research into elephant paths in the region of Kafue National Park. A greater understanding of routes and seasonal use of areas will improve land-use planning and HEC mitigation measures. Since September 2011 poaching of wild elephants in Kafue National Park has increased sharply, with some of the poaching events occurring within 15 km of the study area. In other areas of Africa, a direct link has been made between crop damage from human-elephant conflict and the levels of elephant poaching. Communities adjacent to southern Kafue National Park have become disgruntled with the increasing levels of human-elephant conflict and are urging Zambia Wildlife Authority (ZAWA) to control it. In the study area, 355 problem elephant incidents have been reported to ZAWA since 2007 and local media reported in 2012 that elephant crop-raiding resulted in displacement of farmers from their homes due to fear of elephants. Community members feel that the elephant population is increasing rapidly and are pressuring ZAWA officials to do more to alleviate the associated problems within communities. By alleviating this conflict, it is anticipated that communities will be more accepting of elephants and thereby work together with ZAWA for their long-term conservation. 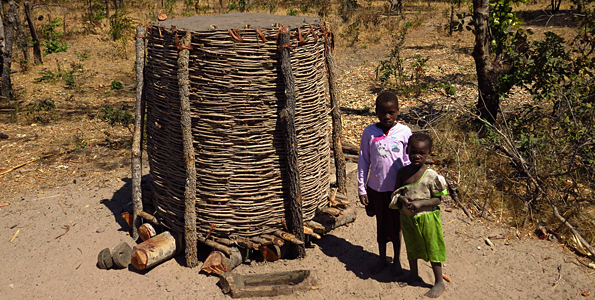 The three recipient farmers of brick Granary stores had previously stockpiled their maize harvests in traditional timber and thatch stores, which were vulnerable to elephant raids. Elephants have not raided or caused damage to the brick stores since they were constructed. Data collected from owners of traditional timber and thatch stores in the study area have shown that on average five percent of farmers in the region are affected each year by losses from their maize stockpile due to elephant raids, which poses a significant threat to these farmers’ livelihoods as many do not have funds to replace this maize to feed their families. The effectiveness of the brick Granary stores has now solicited interest from many farmers in the area and from other funders, due to their positive effect on food security. A further 20 brick Granary stores are now scheduled to be built in 2015, during which time each recipient will be trained in the construction technique to ensure this knowledge will be widely available within the community to assist other farmers to construct their own in the future. By decreasing farmers’ fears about their food security between each maize-growing season, the secure Granary stores will work towards reducing overall negative attitudes towards elephants. Major findings and accomplishments to date: Flashing Light fencing systems were 100% effective in deterring elephant entry into maize fields at two of the three sites, however at one of these two sites, elephants did enter the fields via the unfenced sides on four occasions. The third site experienced almost daily elephant encounters, and after one month, elephants began to break through the fence, as they became more habituated to it. When Flashing Light fencing systems were trialled on vegetable gardens in the dry season, two plots that were near to elephant movement pathways experienced raids, whereas those with less frequent elephant visits were unaffected. As such, in high impact areas, this mitigation measure appears to provide only short-term effectiveness and may be best applied in locations where crop-raiding elephants are less frequent visitors. During the 2015 maize-growing season, continued trials will be conducted in such areas that have lower visitation rates to assess continued effectiveness over time. In high impact areas, different trials of alternative mitigation measures are planned. Results of the 2014 trials will be submitted to a peer-reviewed journal in 2015 and forwarded to IEF once published. 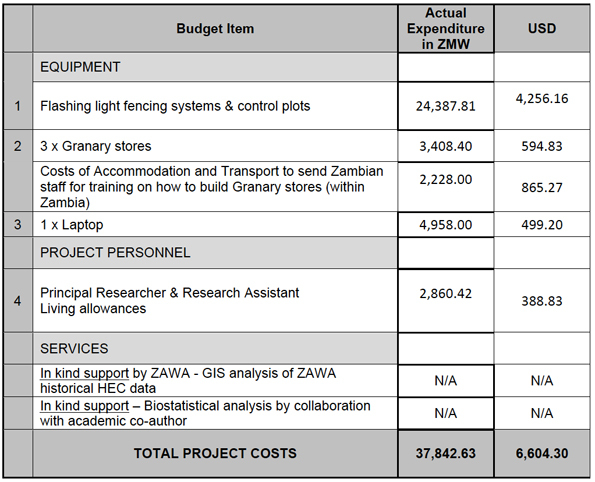 A significant vehicle breakdown hampered trials of Flashing Light fencing systems during the maize growing season however sufficient data were obtained for analyses. methods to secure equipment will continue to be trialled. Our short term goals were to reduce pre and post harvest maize crop losses from elephant damage. Our trials of Flashing Light fencing systems although not 100% effective did show potential to reduce pre harvest losses to elephant raids, and were successful in doing so for most of the farmers involved in the trials. Our small trial of Granary stores showed that this measure is successful in eliminating post harvest losses to elephant raids. Our long term goals were to provide solutions for human-elephant conflict within the communities bordering southern Kafue National Park, Zambia and help communities to realise some benefits from living with elephants. We have taken great steps towards this goal in the last 12 months by making new deterrents available to farmers, positive engagements with the community and introducing trials of chilli crops with a known market and buyer. Continued trials of Flashing Light fencing systems will be conducted to assess elephant habituation rates in locations where elephant visitation rates are irregular. This will provide sufficient information about the effectiveness and best use for this method. New trials of deterrent fences incorporating electric wire are planned for high impact areas during the maize-growing season of 2015. 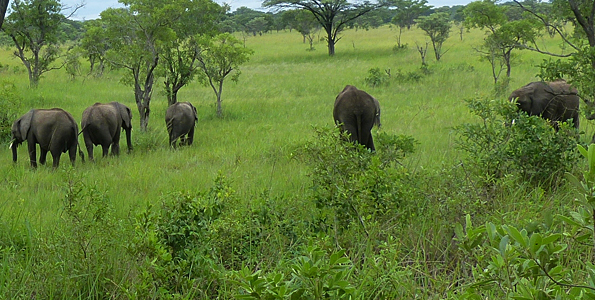 Research into elephant movement pathways between the protected area and the community. This may lead to identification of potential elephant corridors and is also vital information for any future discussions relating to conservation land use planning in the communities. iii) control with no treatment. These first trials showed that the efficiency of Flashing Light fencing systems in deterring elephants correlated with the visitation rate of elephants to fields, with high visitation rates resulting in rapid habituation of the elephants to the lights within a month. Following the first trials on maize fields, additional trials of the Flashing Light fencing systems were undertaken between August and November 2014 to test their effectiveness in deterring elephants from eating dry-season vegetable gardens, which are hand-cultivated beside rivers by subsistence farmers in the study area. Such trials were originally unplanned, but were requested by the local Chief because this area experiences almost year-round conflict, with elephants eating maize from February to May, vegetables from September to November, and mangoes from October to January. As such, attitudes towards elephants are more negative in this area compared to the neighbouring chiefdom, where crop-raiding elephants are only a problem between January and May. Ten Flashing Light fencing systems were erected to completely encircle individual vegetable plots (average size 15 x 20 m). During these trials, 2 out of 10 plots with Flashing Light fencing systems were raided by elephants, compared to 13 out of 19 control plots. These trials showed that although not 100% effective, the Flashing Light fencing systems were more effective in deterring elephants than traditional Acacia thorn fences. The immediate conservation/community outcomes from our 2014 work are that through our engagement with the community, farmers’ attitudes towards conflict with elephants has improved. Many community members are now keen to participate in future trials and have a positive outlook about how new technology can help them with human-elephant conflict. Zambia Wildlife Authority. Project partner providing support, advice and manpower. 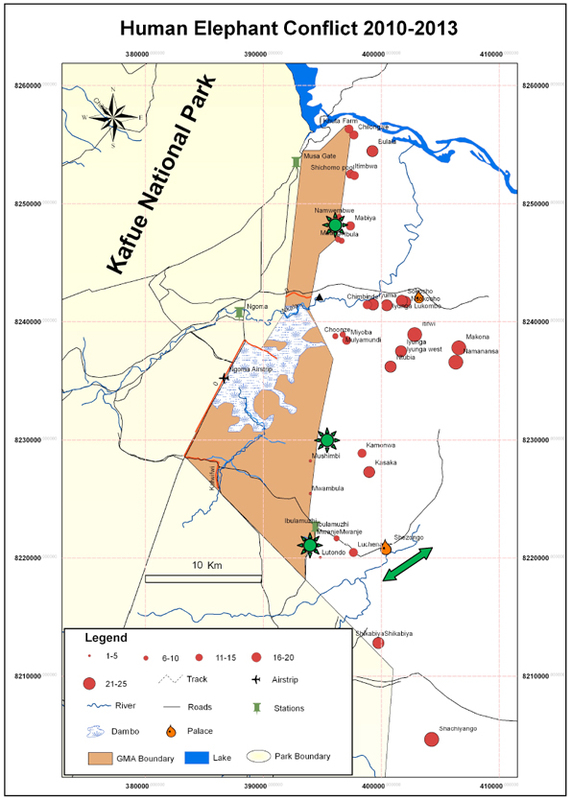 Number of farmers (red circles) experiencing human-elephant conflict from 2010 to 2013 in the communities adjacent to Nkala GMA, Kafue National Park, Zambia (data from Zambia Wildlife Authority). Trials of Flashing Light fencing systems were trialled at three sites on maize crops (green stars) and at multiple vegetable plots along the Nanzhilla River (green arrow).